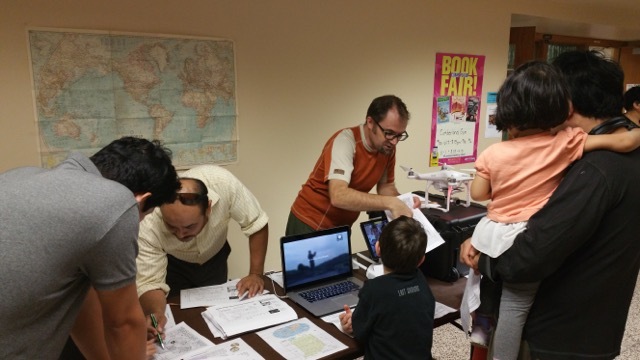 Dr. Ian Lindsay (ArAGATS co-director) and a Purdue University colleague assist students with a geocaching game at Cumberland Elementary School’s annual Math Night (West Lafayette, IN). In an age where assisted navigation systems are available in every new car and standard in our mobile devices, it’s not hard to imaging how the spatial reasoning skills that humans have honed over our long evolutionary history might begin to decline. Indeed the weakening of wayfinding skills is a phenomenon that is being documented in ethnographic cases across the globe, and is part of a broader debate in society about the degree to which modern technology is enhancing human cognition or stunting it (see for example Nicholas Carr’s The Glass Cage [Norton, 2014] vs Clive Thompson’s Smarter Than You Think [Penguin, 2013]). However, even as advanced satellite imagery and navigation technologies help archaeologists document ancient sites with increasing precision and accuracy, map reading and spatial reasoning remain fundamental skills in archaeological fieldwork and analysis. So who better than an archaeologist to instill the value of maps to young people? With this in mind, I spent an evening at Cumberland Elementary School’s annual Math Night on September 25, using a simple geo-caching game to teach K-3rd graders about the importance and fun of map skills. First, I employed a mock pirate’s treasure map to teach the students about locating places using a set of spatial coordinates (i.e., latitude/longitude). Students were then presented with a map of their school overlaid with a grid and provided with three sets of coordinates that would guide them to secret prizes at each location, usually a classroom. It was an entertaining and rewarding way to enhance applied spatial reasoning and basic math skills relying on kids’ inherent desire to find stuff! Of course, it didn’t hurt to have Project ArAGATS’ DJI Phantom 3 quadcopter (or, drone) on the table to spark their imagination! Project ArAGATS celebrates the accomplishments of Dr. Ian Lindsay of Purdue University’s Department of Anthropology, who has joined the ranks of associate professors. Congratulations, Ian!